As parents, we know that constructive toys like Lego have a positive impact on juniors’ creative journey. Some people may argue that Lego set should not include how-to instructions, because they’re afraid that juniors would prefer to follow instructions rather than starting their creations from scratch. Hence, some parents have been trying to urge their juniors to play Lego without the instructions or even play Minecraft instead. While Minecraft is a creative building game that allows players to build a virtual 3D world using colorful cubes, it’s not really suitable for younger juniors to play. Fortunately for us, Toca Boca has just released its own version of a constructive toy for juniors, entitled Toca Builders. 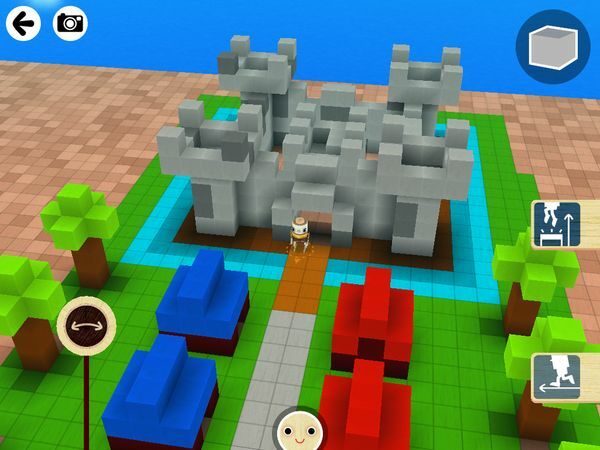 Toca Builders is a terrific, Minecraft-like construction toy for juniors. Here we have A castle made with Toca Builders. One of the first impressions that people have when they watch the teaser trailer for the app is that it feels a lot like Minecraft. After observing how my three-year-old Philip playing it for the entire week, I have to agree with that statement. Toca Builders is quite straightforward. Once you tap the play button, you can either start a new world or continue any of your previously saved creations. Upon entering a world, tapping on the builder icon on the bottom of the screen would prompt you to choose any one of the six builders. Choosing a builder would shift the focus on him regardless wherever he is on the board. Blox the Hammer has the ability to drop a block as he moves, but he will smash any block in his path. You can control his block-dropping action by toggling the switch on the right hand of the screen. You can also drag the turning stick to the left or right to make him turn. Then, you can tap the move button to make him walk in the direction he’s facing. Cooper the Ball is a painter. You can use him to paint the ground by moving the ball-shaped controller. Like Blox, you can make Cooper move to a new location without dropping any paint on the ground. Keep in mind that if he can’t paint any blocks, he merely paints the ground. Vex the Jumper is the only builder that can jump and walk on stacks of blocks. Vex would only drop a block when he jumps. He can create stack of blocks up to six blocks high. You can control his movement using the turning stick, move button, and jump button. Stretch the Tall can stretch himself to reach high places without jumping, and leave blocks suspended in mid-air. Stretch's ability is one of many tricks that you can use in this app. Simply turn the switch up or down until you reach the height you want, and leave your block there. If a block is there already, tapping on the drop button would destroy it. Keep in mind that Stretch can’t put a block on the first level or any level higher than six blocks. Connie the Crane loves to lift and move blocks. He is useful when you want to undo certain actions as there isn’t an undo button in this app. Connie uses cranes to pick up one block at a time, starting with the top of the stack. His crane has a limited radius, so he won’t be able to reach a block if he can’t move closer to it. Jum-Jum the Painter is the only builder that can’t move, but he has the ability to access any square on the board. Simply use the ball-shaped controller to point a location, then tap the paint button to paint to the topmost block on that square. Jum-Jum is very useful for creating color patterns that may be too difficult for Cooper to paint. Throughout Toca Builder, you can change the color used for new blocks or for painting any surface. Simply tap the color button on the top right corner to select a new active color from the palette. You can also pan the camera and change your point of view by dragging left/right or up/down. Zoom in or out by doing the pinch gesture. Once you've finished your creation, you can tap on the Camera button to take a snapshot and add it to your Camera Roll. The app also nicely implements Autosave, which allows all of your creations to be saved without you having to tap on any button, until you delete them from your gallery. Control your point of view of the app by panning left/right and up/down, or zoom in/out by pinching. From a technical point of view, I really like how each character has its own individual controls. I also like how the builders are designed to have unique abilities that complement each others. I get the feeling that they’re there to distribute the complexity of Minecraft-like game controls into six different builders. It feels so natural that you wouldn’t feel like you’re forced to switch tools to get the job done. From a parent’s point of view, I like how Toca Builders has no rules, no penalties, and no time limits. This fits perfectly with the construction-theme of the app. I have witnessed Philip playing the app for countless hours, non-stop, every day. It is quite addictive, but it’s the kind of addiction that I like. If you’re trying to build a 3D shape, keep in mind that the maximum height of stacks is six blocks. Because Jum-Jum the Painter can’t move, you need to start your creation as far away as possible from him to prevent him from interfering with your creation. You will play the game for an enormous amount of time. Prepare yourself, clear your schedule, and if you’re playing with the regular-size iPad, be mindful of your arms getting tired. You will be playing with both hands holding the iPad, and your two thumbs actively controlling the builders. This is definitely an app that is perfect on an iPad mini. When you’re building, try to keep enough empty space surrounding your creation. This is to allow the builders to move in and have access to do their works. Some builders, such as Cooper and Connie, require a wider space to walk. Blox can destroy up to three vertically-stacked blocks, starting with the highest one. If you’re looking to destroy a higher block, you might want to use Stretch or Connie instead. We know that Vex will drop a block when he jumps, but keep in mind that he will also destroy blocks in his path of jump. If you want to build 8-bit game characters, I suggest you visit The Spriters Resource and look for pixel art pieces from old Nintendo games. If you want to build a 3D model of buildings, you can visit Brickset to look for Lego Creator screenshots. Toca Builders is a masterpiece when it comes to toys for kids. It’s the ideal construction toy that many parents have been waiting for. If you have juniors ages four and up, this is a must have. In fact, I wouldn’t be surprised to see many adults loving this app as well. Cookie Next Door ~ Rainy Days. Record your own dialogues for a comic book adventure and see it come to life. Mosaic HD. Create pictures from colorful beads and share them with artists around the world.